Here's probably is the best custom built outcome coming from a British old truck which made by Austin (BMC), this an 1949 Austin A40 pickup truck has been modified and totally restored based on a younger Triumph TR6 chassis and drivetrain. The Austin A40 pickup, one of many race transporters of the famous old days! Try fitting 4 big guys into one of these & driving 2,000 kms each way ... in Europe especially in UK. As we've see here all looks awesome and bit shorter than the original, body frame and interior seems had perfect touch coming from the expert. 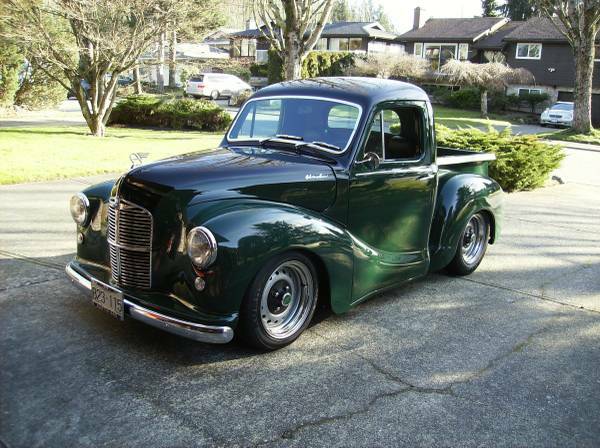 Not so clearly information and photos of the engine but is excellent condition was written on Craigslist about 14 days ago location in Surrey, British Columbia, Canada for $32500.